I have been at this for four months now and have enjoyed it immensely. I have seen over 100 new objects through my Nexstar 8SE as well as revisiting some old favourites. M51, the Whirlpool – 2 galaxies – 1 devouring the other. M13, a globular cluster – a snowball of stars. Caldwell 6, the Cats Eye planetary nebula. A blue-green ball. Early astronomers like William Herschel thought these were planet-like structures – we now know this is a dying star (like our own will be one day) shrugging off layers of gas and making the gas glow from within. The weather has been poor recently so I have been thinking about how to upgrade my scope. The GoTo function has been great, allowing me to work through a list of targets each night but if it is off, then I search around or just re-align and try again. Sometimes I think I am just too zoomed in! The widest eyepiece I have gives me 67x magnification (and shows about 0.75 degrees of sky -about 1.5 moon diameters) and although I find the zero magnification red dot finder great for rapid scope alignment, I think it would be useful to have an in-between zoom level to look at a constellation or region as a whole. An 8×50 finderscope attached to my main scope sounds good – just like having a co-axial half pair of binoculars. Such a scope covers 5 degrees of sky -about 10 moon widths. Unfortunately, this leads to a problem – the Nexstar has only one attachment bracket and the RDF is currently attached to that. Looking through the Cloudy Nights forum on the Internet, it looks as though lots of Nexstar owners get round that by just using double-sided foam backed tape. Initial experiments with this seem favourable, leaving me a slot for the heavier 8×50 scope. I would also like to use wider eyepieces for open clusters and large objects like the Andromeda galaxy and Rosette nebula so a larger visual back and diagonal might be worth investigating to permit 2 inch eyepieces like the 36mm wide angle Baader Hyperion aspheric modular (this covers just under 2 degrees of sky). GoTo function was quite poor last time so even though it wasn’t a great night, I wanted to just test my scope. I thought that looking for double stars would be good since they are bright and easy to spot. Glad to say everything checked out okay. The other new things I tried were a Vixen NPL 30mm eyepiece and a Baader Hyperion clickstop zoom mark III eyepiece. The Vixen has the same true field of view as my 25mm Meade 5000 HD 60 (0.75 degrees) but I thought it was much sharper with better contrast and colour for what is a relatively cheap eyepiece (about 1/30 of cost of scope). Jupiter was obviously small at this magnification (x66.7) but was very sharp and contrasty with good delineation of the cloud bands. It was also quite bright and would have benefited from a filter for serious study. Andromeda galaxy was stunning through this. The Orion nebula (M42) showed 4 Trapezium stars and the structure of glowing gas in the nebula more clearly than I have seen it before without either UHC or OIII filters. The Cats eye nebula (Caldwell 6) was a richer blue/green colour. Once centred on Caldwell 6, I slipped in the Baader. I was able to gradually zoom in through 24, 20, 16, 12 then 8mm. 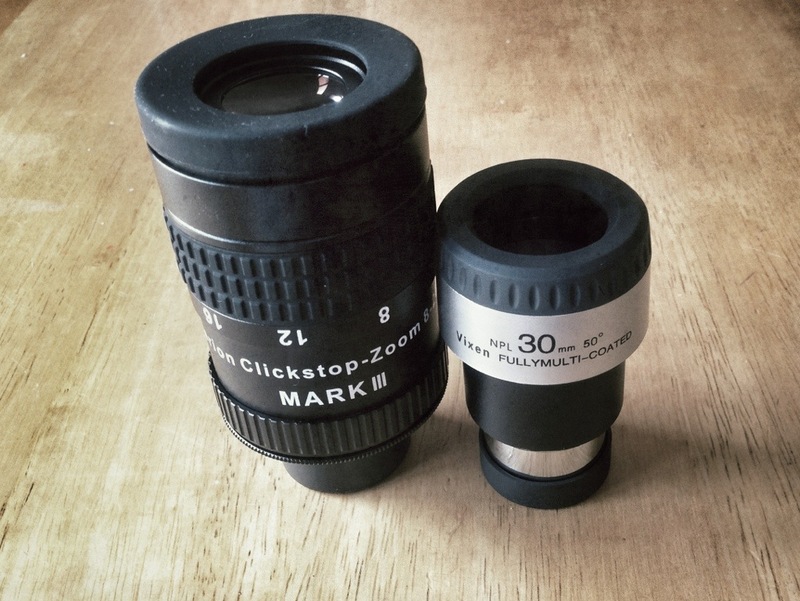 This saved a lot of time changing eyepieces and refocusing. The best views for me were at 16-12mm. I could see the faint halo around the object best at these levels. It worked well also for Jupiter down through the stops. Although focus was difficult at 8mm, I suspect that is related to the characteristics of my scope rather than the eyepiece. Overall, a mixed night but the Vixen is my new default general purpose/alignment piece and I look forward to using the Baader for planets/moon/planetary nebulae and globular clusters as well as double stars. Seeing was good tonight. Watched Jupiter for a while, very clear – not a shimmer. All 4 moons visible. I had printed a list of targets but a lot of them were either below my visual horizon or too far north for my backyard. I kept coming back to M13 – the rather spectacular globular cluster in Hercules – never disappoints. Caldwell 6 Cats Eye Nebula /Draco – large pale bluish (in my scope) planetary nebula. Impressive! Herschel I NGC 4656 /Canes venatici Hockey stick long arm. Herschel I NGC 4657 /Canes venatici Hockey stick short arm. OMeara Hidden Treasure 23 NGC 1502 /Camelopardalis open cluster.